Our new RowPro Multi brochure is so new it's not even in the box with your Concept2 Indoor Rower! 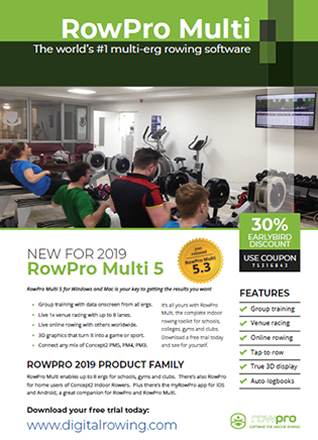 Before we release the new brochure we're offering you a 30% earlybird discount on RowPro Multi if you rate and comment on the new brochure here. Download the new brochure now and take advantage of the great offer! If you would like a response please include your email. © 2019 Digital Rowing Inc.